Fallout 3 is a post apocalyptic role playing action/first person hybrid video game released by Bethesda in October 2008. The game takes place in the year 2277 in Washington DC after a nuclear apocalypse occurred 200 years before. You play as a character who has lived his whole life underground in a vault safe until you journey to the surface. 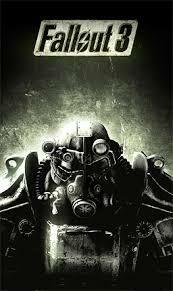 Fallout 3 is the third game in the Fallout series. The first two games were similar in story but game play was very different. In the first two games your display was an 3/4 top down view. In Fallout 3 the game is first or third person, depending on your choice. In the beginning of the game you create a character basically the same way you would in a regular RPG. When you're a baby you pick your S.P.E.C.I.A.L skills (Strength, Perception, Endurance, Charisma, Intelligence, Ability and Luck. Once those are set you age and when you hit 16 you take your G.O.A.T. (Generalized Occupational Aptitude Test). The G.O.A.T test lets you pick three skills that will be your main skills as you pay through the game. The skills you don't pick are still able to be used but will be at a lower level so will not work as well. The game also gives you a Pip-Boy 3000 which is a wrist mounted computer that allows you to access the games menus. As you play the game you collect experience for kills and tasks completed and when you get enough XP you level up which allows you to add more skill points to the skills you want to upgrade. It is just like any other RPG and works very well. The game has you leave the vault and explore the "Capitol Wasteland" killing things, doing quests for people and so on. I'm not going to give the plot away but it's a very good story and gives you choices to make that can drastically change the way the story unfolds. One of the key things in Fallout 3 is the VATS (Vault-Tec Assisted Targeting System). The game has combat play out in real time but when you activate VATS the game pauses and allows you to target your opponent in different locations of their body to do different things to them. You can click from head, chest, arms and so on and it tells you the percentage chance you have of doing damage to that part. The head will always be harder to hit than the chest because it's smaller than the head. When you target a specific area of the body it will do distinct damage to that part which effects that enemy. Shooting the arm that holds their weapon and doing damage will make it hard or impossible to damage you. Shooting the head will make it hard for them to concentrate and attack you. Of course if you do too much damage it will kill the enemy. Once you start using VATS you'll grow to love it. The game handles health in a great way. There are plants, boxes and cans of food, meat from animals you kill and so on. As you find these things you can eat them and will sometimes raise your health but some things will affect your body in different ways. Drinking booze will give you pluses and minuses to your attributes which makes the screen blury and it will make it harder to fight. Your body also has to be kept hydrated so you need to drink water and most of the water available is irradiated which increases your rad level. Once it gets high enough you get radiation poisoning and the higher it gets the more your skills decrease until you die or lower your radiation. On the other end of your health is medicine. You can find stimpacks all around that of course will heal damage you've taken. Also if you find the ingredients to build stimpaks you can make them. This works for all objects in the game, if you know how to construct an item and have the parts then you can build it. But beyond stimpaks are drugs that can be used. In game all the drugs have fake names but they are modeled off real drugs like morphine. When you use these drugs enough your body becomes addicted to them and if you don't feed your bodies need you get sick. The same thing happens with alcohol if you drink too much of it. If you come across a doctor in your wanderings they can cure your addiction or heal your wounds if you have enough to pay for it. Weapons you find and use become damaged and will need to be fixed by someone or by yourself. To fix something you will need to have another version of that item that is in better condition to fix it. It will destroy the one you use and the original item will be in better condition and work better. The game also has a Karma system that has a big impact on the way the game plays out. If you do good deeds than nicer people will talk and help you out. If you play as a jerk you gain negative karma and the nicer people won't have anything to do with you. This play mechanic can come into play and effect your story as if you have really good or bad karma certain choices will not be available which adds to the game play. Fallout 3 also has companions that you run across and can have them travel with out to help you. You are allowed a dog named Dogmeat that you come across and you can have one humanoid companion. You will meet different people throughout your travels and if you help them they can accompany you if you want them to. Just make sure if they tag along you keep an eye on them because they can be killed. Another thing is if you have a karma ranking in line with a group of people within the game which allows you to hang around with them but your companion doesn't that companion will be attacked and be killed so be careful. Once you complete the main story there are numerous DLC packs you can buy and play. Each one is great and allows you to keep your character to play with and increase their stats. Once all the DLC was released a Fallout 3 Game Of The Year Edition came out that included the regular game and all 5 DLC releases. Even though Fallout 3 is 7 years old at the time of this writing I highly suggest that if you haven't played it and these type of games sound interesting than you should try it out. I rate Fallout3 at a 10 out of 10!